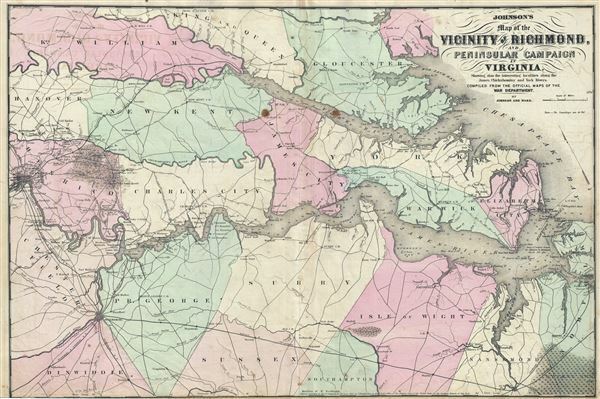 This is a rare and important 1862 Johnson and Ward map of the vicinity of Richmond, Virginia, during the American Civil War. The map shows the Union advance during the Peninsular Campaign of the American Civil War, including considerable detail ranging from nautical depth soundings to individual buildings, wells, and bridges. It is extremely rare to find this map in good condition as it fully occupied its page in the Johnson's atlas, lacking space for substantial protective margins. Consequently any edge damage, common in old Johnson atlases, invariably severely impacted the map itself. The map is dated and copyrighted 'Entered according to Act of Congress in the Year 1862 by J. Knowles Hare in the Clerks Office of the District Court of the United States of the Southern District of New York,' and was printed by Johnson and Ward in the scarce 1863 Civil War edition of Johnson's Family Atlas. Very good. Overall age toning. Some spotting at a few places, especially near centerfold. Original centerfold exhibits minor wear and verso repair.